Cooking, series and a lovely weekend! I had a quiet week without too much socialising and I noticed how much more energy I had in the evenings when I just went home to cook (which I did every night) and watched a few episodes of a series or read my book, than when I’m out for dinner and drinks several times a week. Cooking wise it was quite simple meals, proper weekday grub, which was nice. I made a batch of tomato sauce on Monday for supper that same evening and the night after (love planning ahead like that!). Half of the tomato sauce was used for shakshuka (isn’t it just the best supper dish?!) with onions and carrots and topped with creme fraiche and feta. Similar recipe here. On Tuesday I spiced up the rest of the tomato sauce and used it to make enchiladas. Yum! Wednesday I cooked a new recipe but I want to photograph it again before I put it on the blog, so stay tuned. Thursday I had a sudden craving for dauphinoise potatoes and so made a small gratin and ate it with some roasted chicken from the freezer and steamed broccoli. I continued to watch The Truth of the Harry Quebert Affair (not many episodes left now!) but also started watching Killing Eve on the BBC which is really good! Friday night we went out for a pub supper before seeing First Man at the cinema. Great film – highly recommend it! On Saturday I met up with my foodie friend Anna and her daughter, visiting from Sweden, for some shopping and a lovely afternoon tea at Zetter Townhouse in Marylebone. In the evening I went for drinks before cooking a late pasta supper at home. Sunday we had a lie-in and a nice cooked breakfast at home before going for a pub lunch and a walk by the river. It was freezing so afterwards we cosied up on the sofa watching Murder on the Orient Express (which wasn’t that great but had an amazing cast) followed by some more of The Handmaid’s Tale. For dinner I made this chicken gratin and for pudding we had vanilla ice cream, homemade raspberry coulis and crushed biscuits, for a bit of crunch. Apart from the sudden cold weather it was a good week! On Fridays we usually have something with prawns or Mexican, as it needs to be quick as the cook (me) is tired, go well with a glass of wine and give us that Friday feeling. 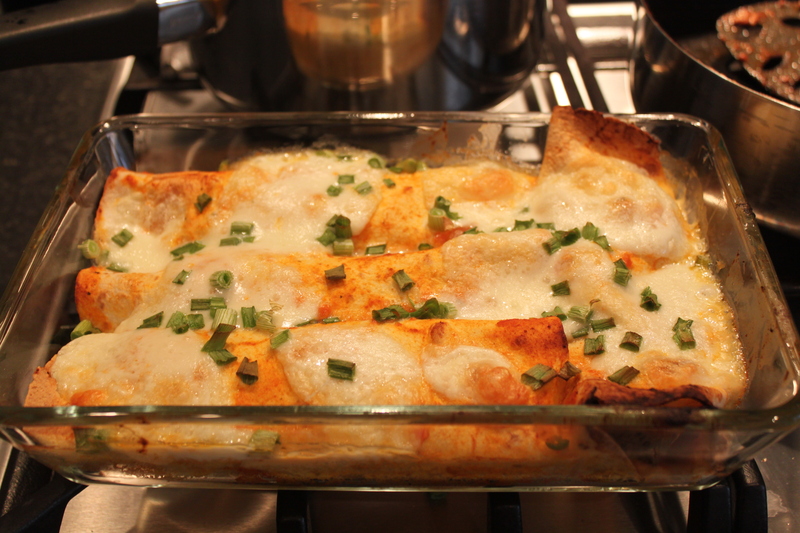 Last Friday we had enchiladas and they certainly give you that feeling! I used mozzarella on top of these, but it is actually even better with a grated strong or medium hard cheese on top for more flavour. Fry the onion and put to the side. Fry the mince. Add the spices and the onion. Mix in the creme fraiche. Season to taste. 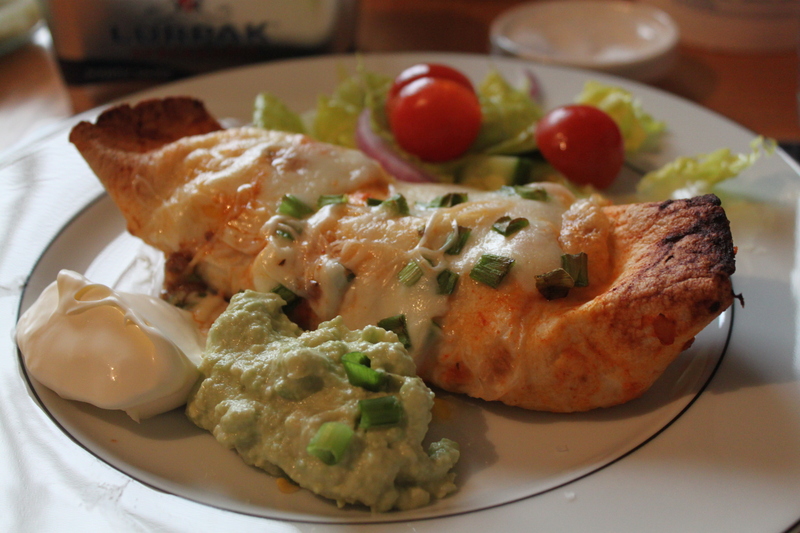 Dip the breads into the enchilada sauce so both sides are covered, add a spoonful of the meat mixture and roll it up. Place in a greased oven tray and repeat until the meat is used up. Top the oven tray with grated cheese and spring onions. Bake in 200C for about 30 minutes. Serve with guacemole, salsa, creme fraiche and salad.